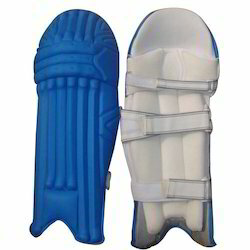 Providing you the best range of cricket batting pad, cricket batting leg guard and cricket pad with effective & timely delivery. 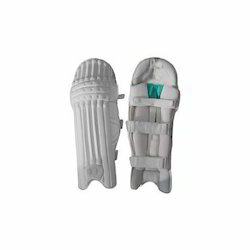 With an aim to fulfill varied requirements of our valued clients, we are engaged in offering Cricket Batting Pad. The offered pad includes PU leather material. The whole pad weighs 220 grams, which is industry approved mass for a perfect, well-shaped pad. This pad is manufactured using PU leather having two layers of polyester composite lining. In addition, this pad has been hand stitched by our professionals that add durability. 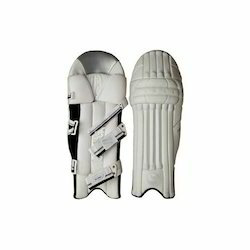 We are one of the noteworthy enterprises engaged in offering superior quality Cricket Batting Leg Guard. The offered leg guard is manufactured using PU leather materials. Four layering techniques are applied to offer a robust thickness to the leg guard. Quality-centric fabrication being our main concern; our team ensures that the clients avail ideal leg guard for protection. Additionally, we follow the internationally designated standards and smart techniques to create well balanced and accurate leg guard for the players. We are counted amongst the recognized organization offering of premium quality Cricket Batting Pad. In sports, such quality fabrication has been always appreciated. It supports hard play for long hours. The offered pad can be made available at industry leading prices to the clients. Applying such material during fabrication of the offered pad helps in providing a protective layer against alkaline, lead and various other chemical elements present in air and on ground. Our firm has gained continuous appreciation as the prime organization offering of Cricket Pad. This pad is fabricated using PU leather materials and innovative techniques. To ensure that, we process the pad using quality materials, industry approved materials and prints. Using PU material and modern techniques have helped in developing pad that always delivered lightweight playing experience to the players. Also, the offered pad is made available at reasonable prices to the clients. 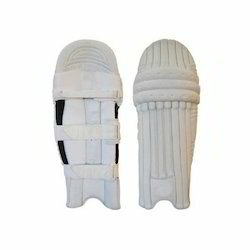 Looking for Cricket Pads ?